Jack Lieberman gave a great presentation on little-known Captain Percival Drayton, USN, and his brother Brigadier General Thomas Fenwick Drayton, CSA. This family situation became “brother against brother.” Percival had enlisted in the Navy in 1827 and served up to and into the Civil War. 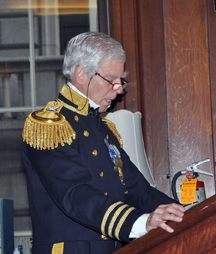 His career reflected the history of the Navy through its early years. 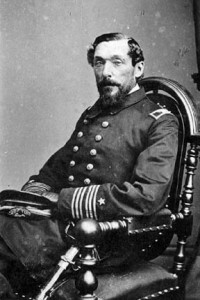 He was stationed at the Philadelphia Navy Yard when the Civil War started. He was given command of the USS Pocahontas and took part in the Port Royal action in November 1861. During this battle he actually fired on troops of his brother who was in command at the time. He was promoted to Captain and assigned to Admiral Farragut’s Squadron and took command of his flagship USS Hartford. He was in command as the fleet attacked Mobile Bay. When the war ended he lived in Philadelphia and died of a twisted bowel obstruction and buried in Philadelphia. A great presentation and a great turnout. Jack will always be welcomed back. Jack P. Lieberman, Captain, USN (Retired), is a native of Cheltenham, PA. He received his B.S. Degree in accounting from Villanova University in 1965. Following graduation, he received a commission as an Ensign in the U.S. Navy and served during Vietnam as a Gunnery Officer aboard USS San Marcos (LSD-25). Attaining the rank of Captain, he was Commanding Officer of various units and Chief of Staff Officer during Exercise Rainbow Reef in the Indian Ocean, a convoy training exercise, preceding Operation Desert Shield/Desert Storm. Upon release from active duty, the U.S. Naval Academy, Annapolis, MD, called upon him to work with applicants and Congressional staffs, as a Blue and Gold Officer. In addition, he accepted a position as an Internal Auditor with Atlantic Richfield Oil Company (ARCO), which utilized his management, organizational and financial skills in a corporate setting. Jack is also graduate of the Naval War College, Newport, RI, and is currently Vice President of the Philadelphia Council, US Navy League. This entry was posted in Meeting archive on May 12, 2011 by hlj.